Hello! I hope this is the right place to brag about this wonderful gingerbread house that my friend pnr and I made during Christmas! 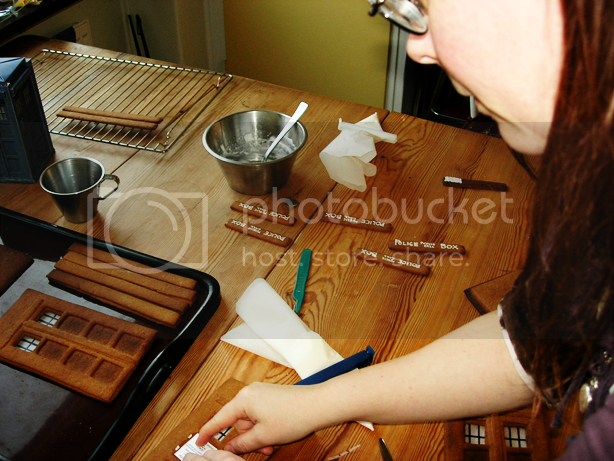 EDIT Dec 2007: A detailed how-to post can now be found in crafty_tardis! The pictures are taken by me and pnr , and polished up and hosted by pnr. 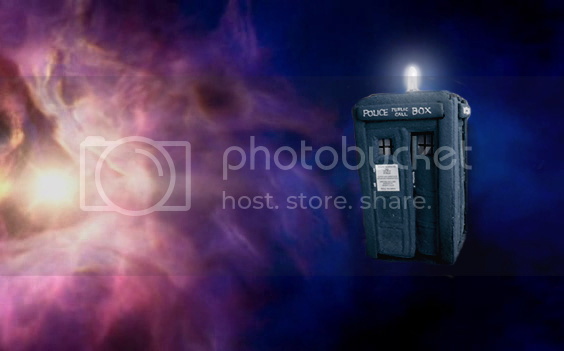 We had tremendous fun, and the TARDIS looks fantastic on my kitchen table! That's really awesome. 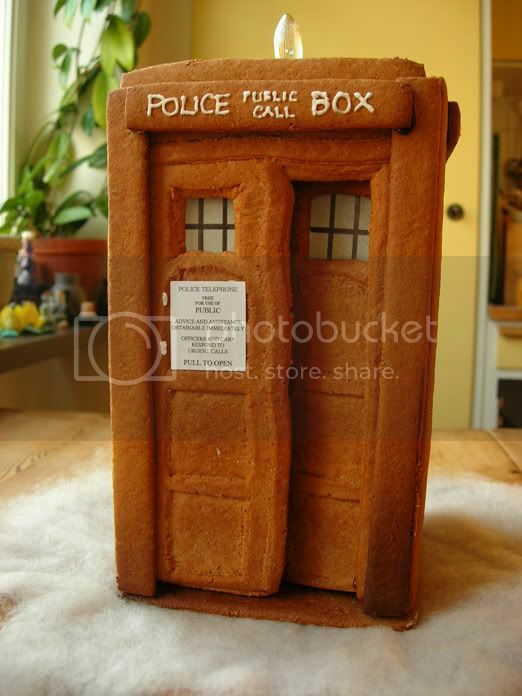 You need a Gingerbread Doctor, too. He can go, "At last, I'm ginger!" Oh. Do you really think so? What is this DWM that you speak of? Awesome. 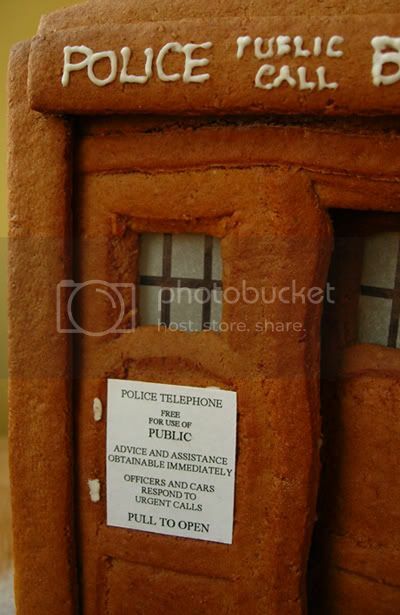 I am midway through making a gingerbread Tardis myself, but I doubt it will ever get finished XD. Well, the trick is to remember to not eat the pieces before you have stuck them together. That is about the coolest thing I've ever seen! I'm probably going to be too soft-hearted to try and eat it, so that it will get all dusty and stale, and I shall have to keep it forever. Or until it gets soggy and falls apart. It puts my annual Gingerbread houses to Shame. Shame I Tell You. ...But then I always eat mine. I don't think I could bring myself to eat that masterpiece. It would be a crime punishable by having a Dalek as a housemate for two weeks. ..Do... Do you mind if I try to make one like yours next year? I Enjoys a challenge. 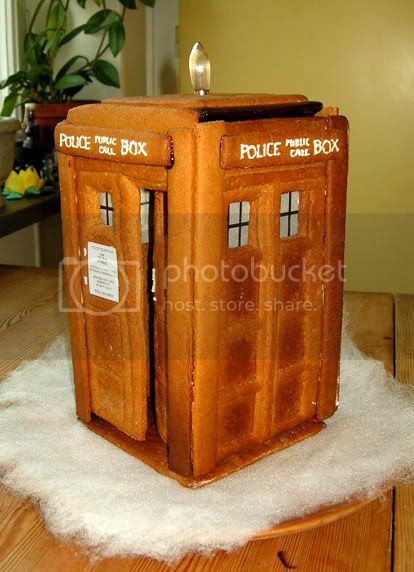 And the world needs more gingerbread TARDISes! Ooo. pretty. That looks totally awesome! Beautiful. Just beautiful. Nice clean lines and authentic details. That must have been so much fun to make! Hey, wanna put up your plans for making this? 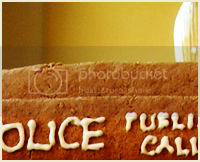 I'm not the most creative person when it comes to construction, and would LOVE to make this this coming Christmas! OH MY GOD! That is so awesome. How did it taste? This page was loaded April 18th 2019, 10:36 pm GMT.